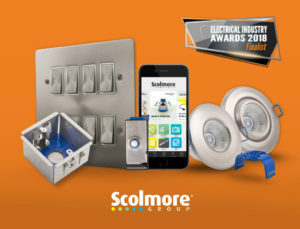 Scolmore has been selected as a finalist with all six of the products entered into this year’s Electrical Industry Awards. Two products have been shortlisted for the Residential/Domestic Product of the Year – the FlameGuard Back Box and Inceptor Insulation Support Clip. GridPro – one of the most comprehensive ranges of interchangeable mounting plates – is shortlisted for the Commercial Product of the Year, the Click Dual Mode Dimmer for the Lighting Product of the Year (Controls) and Inceptor Nano – the compact, fire-rated downlight – for the Lighting Product of the Year (Lamps and Luminaires). Finally the popular Scolmore App is on the shortlist for the Electrical App of the Year.